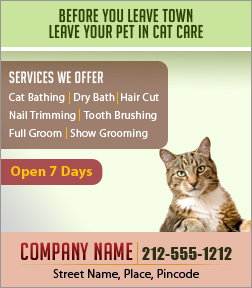 A 3.5 x 4 inch square corner cat care magnet makes a pleasant advertising tool for advertisers offering cat care services. Most of the magnetic stickers are customized with images of cats, which makes them extremely adorable. Advertisers starting out new or wishing to improve the visibility of existing cat care parlor can invest in it for long time benefits. Product Size: 3.5 in. x 4 in.